To open a popup window, use window.open() method. All the parameters are optional. No parameters are passed to window.open() method. 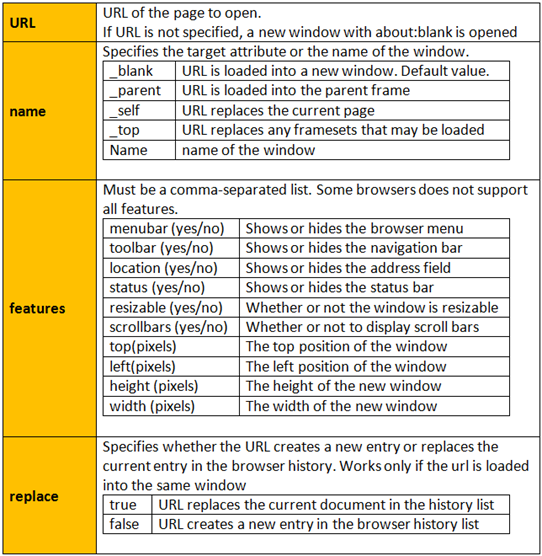 Since URL is not specified, a new window with about:blank will be opened. Most modern browsers open new tabs instead of separate windows. If you want to open the popup in a new window, one workaround I have found is to specify the URL, name, and features(height and width) parameters. This may not work in all browsers and it also depends on user's browser preferences. Specify where you want the new popup window to be positioned using top and left features. Disable scrollbars and resizing. Works in IE but not in Chrome. To close pouup use window.close() method.